A review of Qinghai Across the Frontier: State- and Nation-Building under the Ma Family, 1911-1949, by William Brent Haas. This dissertation is an exciting addition to studies on the empire-to-nation transition in China. It focuses on Qinghai, a strategically important, politically sensitive, yet greatly understudied region, which occupied a unique position in the rise and decline of the Qing Empire. As the author nicely shows in Chapter 1, this region featured uneven topographies and was inhabited by multiple ethnic peoples. Qinghai was the passage linking China to Tibet, muddled by influences from Sino-Muslims in the Northwest and the pastoral Mongols spreading all the way from western Mongolia to northern Xinjiang. It was a real “middle ground” (p. 5) where external and internal actors interacted, mixed, and split. The author selects two angles to observe the complex political dynamics involved in nationalizing Qinghai in the early twentieth century. One is the organization of military forces in Qinghai, with special attention paid to select military confrontation scenarios. It thus illuminates that nation-building was a process fraught with military violence and subjugation. The other theme running through the latter half of the dissertation is education. The author painstakingly examines the various types of schools sponsored by the national government, provincial warlords, and local elite to accommodate disparate local needs. These schools competed against each other, but their combined influence greatly reinforced the trend of constructing citizenship among frontier people. Although, quite regretfully, the provincial archives of Qinghai were closed to researchers during the research for the author’s monograph (p. 4), he nonetheless accomplished a great job in searching, locating, and scrutinizing available published materials, including many rare sources on Qinghai education in the provincial library. Starting from a detailed introduction to the region’s ecological complexity, Chapter 1 traces the origin of multiple administration systems in Qinghai as part of the imperial design to cater to the needs of both the pastoral populations and agrarian inhabitants who were scattered in different places. In particular, they include counties for the agricultural northeast, banners for the northwest, and tribal chieftains and monasteries for Tibetans in the southwest (p. 36). The rise of the Sino-Muslim warlords, especially the Ma family in Qinghai, was greatly indebted to their ability to rein in the political forces situated at the intersections of these ecological zones. While projecting power from Xining to southern Gansu in 1917-1918, the Ma family forced the end of hostilities between two Tibetan leaders around Labrang Monastery (p. 40). The influence of the Ma family extended to the pastoral peripheries of what would become Qinghai province; they also simultaneously competed to gain the military appointment that would allow them to control “restive” Tibetan regions (p. 40). After the fashion of James Leibold (Reconfiguring Chinese Nationalism: How the Qing and Its Indigenes Became Chinese. New York: Palgrave Macmillan, 2007), the author refreshes our interest in the history of warlords in China. If the conventional history repeatedly creates profiles of parasitic warlords, the author portrays the Sino-Muslim warlords as an anomalous group struggling between ethnic self-interest, regional autonomy, nationalization, and military ambition. Making this statement, the author also addresses nationalism literature represented by John Fitzgerald (“Administration and Autonomy: a History of Bureaucratic Provincialism in 20th Century China,” in Shu-min Huang and Cheng-kuang Hsu, eds. Imagining China: Regional Division and National Unity. Taipei: Institute of Ethnology, Academia Sinica, 1999), who views nationalism in China as congruent with provincialism or localism. Like Fitzgerald, the author does not consider political fragmentation as destructively splitting of nationalism, but sagaciously points out that the fragmentary regimes of the warlords are the very sites of constructing nationalism. Chapter 2 recounts the Yushu borderland war in 1932-1933 between the Qinghai provincial army and an army of Tibetans. The sources include government reports and oral histories (as found in Qinghai wenshi ziliao xuanji. Xining: Qinghai Renmin Chubanshe, 1980), especially the Yushu jinshi ji (Recent Events in Yushu), an official publication produced by the Southern Qinghai Borderland Garrison of which Ma Bufang was the commander, and published in June 1933. The Yushu borderland was a contested ground because multiple groups claimed Yushu’s space as their own place—Beijing or Nanjing on the Chinese national level, Gansu/Qinghai or Sichuan/Xikang on the Chinese provincial level, Lhasa from the Tibetan perspective, and lastly the mixture of Tibetan tribal chieftains and monastic elites for whom this place was the center (p. 50). This chapter captures this critical time, i.e. the 1930s, when China lost the Northeast to the Japanese army and there was a sudden explosion of national interest in the Northwest. Yet, despite its intention, the nationalist government was not powerful enough to bring the frontier regions under regular governmental control. As a compromise, the actual implementation of nationalization was put in the hands of warlords. While unpacking the idea of territorialization, the author nicely refers to the distinction between space and place (proposed by David Harvey and reworked by Prasenjit Duara. See David Harvey, “The Currency of Space-Time,” in Justice, Nature and the Geography of Difference. Cambridge, MA : Blackwell, 1996. Also see Prasenjit Duara, Sovereignty and Authenticity: Manchukuo and the East Asian Modern. Lanham, MD. : Rowman and Little Field, 2003). Moreover, he effectively situates his own study in light of the recent historiographies on the Beiyang government and discoveries made in “New Western” American history. Chapter 3 addresses the little known civil war between Sino-Muslims and Sun Dianying. Sun, a Han Chinese warlord, was ordered by Chiang Kai-shek to station his army in western Qinghai and “open up wasteland” through agriculture. The war between Ma and Sun thus decided who would ultimately control Qinghai: the Han warlord representing the central government, or the Sino-Muslims who were influential in Ningxia, Gansu, and Qinghai. All these relevant parties—whether the central government, leaders of Ningxia, Gansu and Qinghai, or Sun Dianying himself—exploited nationalist propaganda. Yet, they differed in their ideas of concrete measures to modernize the Northwest. Sources used in this chapter include Sun Dianying bu Qinghai tunken dang’an shiliao xuan (Selection of Archival Historical Materials on Sun Dianying Agriculturally Colonizing Qinghai), Minguo dang’an (Selected Archives from the Republic of China), and important newspapers and magazines, such as Xijing ribao (Xijing Daily), Kaifa xibei (Northwest Development), etc. Land cultivation was a contentious point among power holders. The agricultural colonization promoted by Sun aimed at converting land in the lowland river valleys around Xining into agricultural land, “bringing land that was unused but suitable for agriculture under the plow” (p. 114). It was, however, obstructed most stubbornly by the Mongols who held a different set of land-use rights. The Muslim warlords advocated the enterprise of modernizing production, yet they were opposed to the meddling of Sun in territories under their own power. Their opposition was expressed on behalf of the interests of the local people, and it took an interesting conservationist tone (p. 130). Finally, Chapters 4, 5, and 6 address the key question of modern education on the frontier. The three-pronged schooling system included the national education propagated by the nationalist government (Chapter 4), the frontier schools for Mongols and Tibetans (Chapter 5), and semi-private schools for Sino-Muslims (Chapter 6) initiated by the Ma family. Chapters 5 and 6 are especially fascinating, as they show the ambivalent trajectories of modernizing frontier education in order to make it a ground for training useful, disciplined, modern citizens. The imperial model for Mongolian and Tibetan education was a hybrid institution, bringing in local elites and training them as translators to bridge the linguistic, cultural, and religious differences in the region (p. 10). 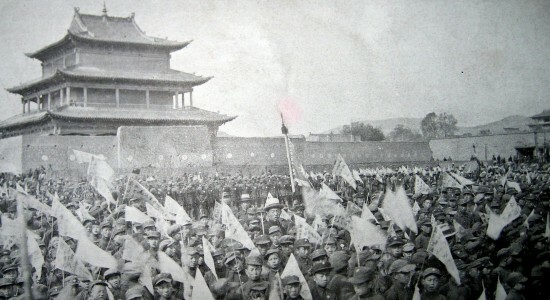 However, from the late Qing to the establishment of provincial rule in 1929, the Mongol and Tibetan schools were largely under the administrative control of Xining’s military garrisons led by the Ma family. The attendees of these schools were children of Mongol, Tibetan, and Salar local elites (p. 228). Set in the context of local power competition, it was nearly impossible to tell whether these people were disciplined as citizens or simply detained as Ma Bufang’s hostages. Moreover, the schooling system was somewhat split by internal factional struggles within the Nationalist government and the system was dominated by the Central Club Clique (p. 247). The author utilizes a variety of sources to delineate the intricate story of competitive educational modeling in this frontier region. To conclude, writing a local history of Qinghai while being attentive to the details of power struggles unfolding at different levels is not easy work. It is becoming even more difficult to write a history that is not only local but also national. The author does an excellent job of incorporating and integrating these two layers of history by nesting colorful stories of local power struggles in the broad narrative of the national transition of China. It will definitely attract readers interested in empire and nationalism, Chinese modern transformation, Chinese warlords, education, and military history. Qinghai nanbu bianqu jingbei silingbu fushe bianshi yuekan she, ed. Yushu jinshi ji [Record of Recent Events in Yushu]. Xining: Qinghai nanbu bianqu jingbei silingbu fushe bianshi yuekan she, 1933. Qinghai wenshi ziliao xuanji [Selection of Qinghai Oral History Sources]. vol. 8. Xining: Qinghai sheng zhengxie wenshi ziliao yanjiu weiyuanhui, 1981. Minguo dang’an [Archives of the Republic]. 1994, 1995. Tujue (突崛). Periodical published between 1933-1944. University of California, San Diego. 2013. 339 pp. Primary Advisors: Joseph W. Esherick and Paul. G. Pickowicz. Image: Students and on-lookers at the welcoming ceremony for Ma Bufang’s appointment as Acting Provincial Government Chairman, 6 June 1936. From “Huanying hui (ba)” [Welcome ceremony (8)], Fengming zanli Qing zheng jinian [Commemoration of Accepting the Order to Temporarily Manage Qinghai’s Government], (Xining: Gu Baoniu gongdetang, 1936).